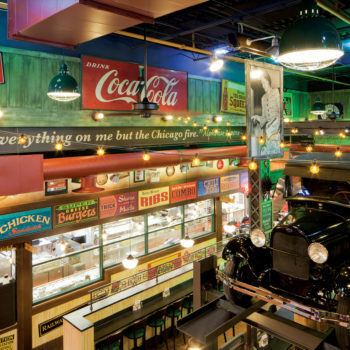 Novak served as General Contractor for 7 new, ground-up, one- and two-story Portillo’s restaurants. Featured here is the Chicago location which offered a second-floor outdoor patio area in addition to the ground-floor patio commonly found at its other locations. The restaurant featured a Prohibition-era, “Chicago gangster” decor with brick veneer, decorative cornices, precast wall panels and a double drive-thru. The interior included new MEPFP systems, an elevator and vintage car on display. The scope of work included excavation, site utilities, concrete foundations and a new parking lot. This is the second location for this restaurant chain in Chicago. Novak served as General Contractor for this 4 acre Portillo’s development located in Woodbury, Minnesota. This project included demolition of an existing building, new site utilities, curbs, asphalt paving, retention pond and site improvements. This restaurant is a precast structure with full brick exterior, patio and architectural steel elements with a prohibition theme complete with a vintage truck. The interior includes new MEPFP systems to support the efficient kitchen and dining areas, complete with all new interior finishes.